Neat programme for Library users with a mac. ≈ Comments Off on Neat programme for Library users with a mac. Hands up who has a Apple Macintosh and uses libraries. Me!!! I’ve just installed Library Books. A cute application that retrieves a list of your loans shows when they are due. It is very neat – sits up in the menu bar and when you click update in it’s dropdown menu, it links to your Library’s website and retrieves a list of what you have on loan – title, author, format and due date. There is a link from the menu to open the renew books page should any become due and a link to the catalogue so you can look up any thing you’d like to read. Simple and elegant. I emailed the developer when it didn’t work for my council initially and he fixed it within a couple of hours. I’m pretty happy with how it worked out. Just read this story on the BBC’s website regarding the links between obesity and dementia. I’ve always been a little frightened of dementia, during the year Joel and I spent apart before we got engaged, I worried about my future life alone – what would happen to me if I needed care? would I get support or would I end up as a street person? etc. etc. My over dramatic view of life plays a huge part in how I feel about this! Thankfully, my sister Lucy promised to make sure I was OK. Thanks for the reassurance Lu. Now it’s Joel’s problem. 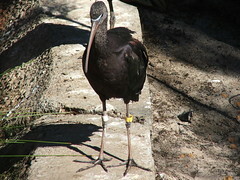 Here is a pic of one of the Brilliant Ibis living at Perth Zoo. When I first saw how this photo turned out, I commented to Joel that it looked a bit “mecha”, like it was out of some anime. He later made the joke that it was actually a kind of cylon – the thirteenth kind! What is amusing me now is that I was just out on my morning walk with Max and saw a “willie wagtail” bird and it had the same look… it looked right at me like it knew I knew. I kept walking. I’m off to fix some breaky and get ready for work. ≈ Comments Off on Tuesday Again!! When I arrived at work today, it was with as Blur* would put it “with an enormous sense of Well-being”. I couldn’t wait to tell everyone what a great weekend I’d had. Recap: went to a wedding (Sarah – uni friend/another freak libarian), beauty appointment, Tranby house for lunch, afternoon tea with Joel’s Mum and Dad, visit to Zoo … a weekend packed with joyous events! You will understand then, that when story-time rolled round and there were 3 children waiting (I usually have around 20) I had a bit of a downer moment!!! Not that I let it ruin my day, but as I’m used to being ignored by much bigger crowds I was (and am) a little concerned – could last weeks storytime been that disastrous? It’s a good thing I won’t be there next week! I had a meeting with Vanessa, who’s been acting in the job I will be doing for the next seven weeks. She gave me a rundown of the projects in hand and showed me the canteen (we had lunch together). The canteen is good! When asked to clarify what interested the reader as per the reference interview (- a hobby could be just about anything after all: computers are found in dewey at 004-006, crafts 745, cooking 641, travel early 900s etc), she got all huffy with me and when I made some suggestions, jumped at them all – so I gave her a quick tour of the library pointing out areas of interest, hoping that we might hit on what she actually wanted. I finished my desk roster after that one and didn’t see if she borrowed anything… I think her interest was in the craft area.